Not to be confused with Brickman. 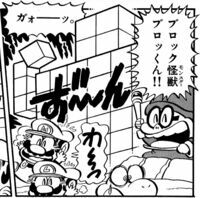 Buro-kun is a creature created out of Blocks by Kamek to fight Mario, Luigi and Yoshi in Super Mario-Kun volume four. It is a towering pile of blocks which lacks the ability to move. Mario finds this hilarious, causing Kamek to try and topple it over onto the three of them. However, they dodge the attack by hiding in a hole in the ground. This page was last edited on March 9, 2019, at 16:09.